Series devoted to saving treasured heirlooms from the scrapheap. In the beautiful surroundings of Stonyhurst College, Lancashire, the team save yet more timeworn treasures. Browse content similar to Episode 6. Check below for episodes and series from the same categories and more! and treasures can be restored back to their former glory and maybe make you some money at auction. Find out how on Restoration Roadshow. There's a real sense of expectation in the air here at Stonyhurst. Everyone has turned up with their treasures, keen to find out if they are worth anything. I think that her value at the moment, is something like £1200 to £1500. Should they be cleaned up and restored? Are they staying in the family? It's enough to buy me a chateau in France! -And will they make any money if they go to auction? Coming up, has Rod bitten off more than he can chew with this mahogany chair? Inside, OK. Let me get my teeth into this. An 18th century heirloom that I'm sure many of you won't recognise. I mean, it's a rare piece. I mean, exceptionally rare. And it's crunch time for this Royal Worcester vase. Somebody, who will forever remain nameless. is home to one of the oldest Catholic boarding schools in the country? Our restorers are certainly planning to be on their best behaviour today. Let's hope that the items don't give them any trouble! Now, quite simply, somebody has taped it up! First in the queue is Fergus Brown. He has arrived with a sorry-looking balloon-back Victorian chair. One of eight, it's been in the family for generations. So any more you can tell me, I'd gratefully appreciate. I'm not getting Scotland at the moment. Do you know what I'm getting? I'm getting the Emerald Isle. You see the shamrocks here? And if you look over here, you see, you've got this almost Celtic-type strap-work. -Now, I can see your problem, because this is very loose, isn't it? I'm not going to pull it off, but it has suffered ravages of time, hasn't it? Well, it was my gran's nephew, I think, running past it, just pulled it and the top piece broke off. and it might have a £40 or £60 price tag on it, but that's looking at it individually, once it's restored. And that's the keyword... Restored. who counts royalty amongst his clients, can nurse it back to health. Let me get my teeth into this. -If I can just come across here... Let's see. Straight away I can see it's got a big chunk missing over here. The line where it's broken is actually quite clean, there's a little chunk missing there. Let me just give it a little wiggle here and see what it's like underneath, inside. OK. Well, that's a lovely clean break in there. That's where the glue joint was before when it was made. You've got the end grain. The grain of this was actually made so that it runs across this way, so this is one bit of wood. so whenever a chair breaks, inevitably it will be here. so that's one aspect that we've got to be very precise with as well, with the actual filling itself. and get the shape coming back in again. The whole thing, I would say, would come to about £150. The most work really, is in the end, in colouring out, in actually making it look like it's a perfect chair. So, are we going to go with this? -Oh, definitely; you can't have a broken chair, can you? No point in having a broken chair! It sounds like an intricate job for Rod. In its current condition, this chair is worth around £60. Rod's restoration will cost £150. could make between £600 and £800 at auction. But with a curved surface, can Rod get the clamps to hold? to see what treasures you have found in your attics. It's a lovely thing. It's got so many colours. Marian Miller has brought in a gorgeous pair of early 20th century Royal Worcester porcelain vases. so very special. But oh, dear, this one looks less than regal! -I mean, it's a sad thing to see, isn't it? Just tell me about it and I'll try to make it as painless as possible. Well, it started with my grandparents. They must have bought them, I think, around about 1974. -OK. Somebody who will forever remain nameless! -OK. Your pots are beautiful. I love pots and I love Royal Worcester porcelain. -I feel the urge to kiss this one, but I'm going to resist. he's got to be there, and he is, Harry Davis. He was considered the great man, and everybody had respect for him. Well, I can think of no-one better to help this vase than our ceramics king, Roger Hawkins. With a lifetime of experience under his belt, he's saved many a sad-looking pot. All we need from you, Rog, is a miracle! It's certainly a challenge but not, by the look of it, impossible. I think we have what looks like a fresh break. -It hasn't been restored before, has it? So, that makes my life a lot, lot easier. If it had been glued before, then it would mean taking all the old glue off and a lot of cleaning. This little piece goes under there. -That's that slither there. That's a godsend, isn't it? Now let's look at the base. -Yes, that fits in perfectly! around £400 to £450 to restore. Can we give Roger the green light on this one? Yes, we can... as long as it's no more! No, it won't be, but I do agree, it's certainly worth doing. I will save it for your family and for the nation! Oh, my, yes, thank you. anything up to £1,500 at auction. So start solving that jigsaw puzzle, Roger, and make this Royal Worcester vase perfectly beautiful again. Coming up, will Rod's skilful clamping prove enough to heal the broken back of this mahogany chair? And what will Roger make of a painted pair of bookends made at a local pottery? Don't try this at home, children. and more like being at the centre of a hospital for antiques, if there could be such a thing! Our restorers are seeing countless objects in desperate need of help. Obviously, you do a lot of writing, because you've worn the thing out! Robert Parker and his family have arrived with a very rare signpost barometer. but this one dates to the 18th century. -I believe it's been in your family for some time? -I don't know, have you got an idea of the date on it? I mean, looking at it, I am thinking it's somewhere around about 1770, 1780 or thereabouts. It might seem a strange thing because the calibrations have gone. so I have to look out the window! because all this area here would have been covered. I'm afraid this damage occurred quite recently, I think. -and I can't even find where the piece is. and we need to do something about it before it goes too far. from a cosmetic point of view, is this little sort of fleur-de-lis is in need of restoration. or is it something you were thinking of moving on? but I think it would be more prominently displayed than it is at the moment. I understand. So, any ideas on value? None whatsoever. Not of the maker or the value. Mmm... Well, we're obviously into four figures and a bit more. -and it's all to do with supply and demand, isn't it? Now, this is going to need some serious restoration. With such an expensive family treasure, we need an expert with supreme craftsmanship. Lucky for us, Malcolm Green is here. With over 30 years of expertise in furniture, he knows a thing or two about barometers. It's one of the most wonderful things I've ever seen, I think. I've worked on a few of these, but this is probably the earliest. I had a stab, because I thought this was about 1770, 1780, late 18th century, anyway. and the fact that we have a paper scale rather than a brass and silvered scale, I think you're right. -And then, of course, the cover. -It's the sort of thing that adds to it. I mean, it's an absolute shame it's not there. Malcolm, to do this justice, how much are we talking about? Well, I think around £2,000, thereabouts. £2,000. How do you feel about that? That's far more than I thought it would be. I think there's no option, really, but to go for the full monty. So, I forecast a serious restoration job for Malcolm. This barometer is worth around £4,000 in its current condition. valued at upwards of £8,000. But of course, Robert Parker isn't selling. He's keeping this in the family. So, Malcolm, we'll keep a weather eye on things as you bring this ancient barometer back to life. and in the shadow of Pendle Hill, an area known for its mystical past. And as if by magic, some bookends from a local pottery with an enchanting history turn up. They're owned by Mike Smith. or even a little bit earlier. I haven't seen these ones before and, obviously, we all know Pendelfin being famous for their rabbits. These little bookends of little pixie girls are quite rare. So where did you get them and how long have you had them? I do removals and I got them at a removal one day. "Do you mind if I take them?" and she said, "No". I've had them ever since. And they were like this? They had already been painted white? Yeah, yeah, I haven't touched them at all. in various colours in a typical Pendelfin fashion. In fact, this is what they should look like. which was created sometime between 1954 and 1958.
these would probably be worth in maybe excess of £2,000? And for little plaster figures, that's going some, but they are hugely collectable. which I know I can take the paint off, but I'll probably take the original colour off as well. so painted like this they really aren't worth restoring. not bad for something picked up at a house clearance. Let's hope they charm a buyer at auction. We've got a great collection of wonderful items here at Stonyhurst. Lucia is hard at work on a lovely Flemish painting. and Rod has started work on that broken balloon-back chair. otherwise they simply won't fit and the wood frame won't align. I took a nice clean line across here. OK, so now it's ready to kind of glue on. He's using a traditional glue that has to be heated to just the right temperature. Too cool and it will turn out too thick. You can see all the glue squeezing out, which is great. Give it a little squeeze along, just using my own force first. It goes off very quick, so you have to be very quick to get the actual clamping itself. If I lose that window, then the whole of this is really in vain. as he attempts to secure the wood and allow the crucial setting process. and fill and restore the colour on those bits there. I'm holding my breath and praying those clamps stay in place! That done, I'm sure these chairs will attract the bidders at auction. when Marian Miller brought in her shattered Royal Worcester porcelain vase. It was such a tricky job that he had to take it back to his workshop. but now he has got the delicate job of sorting out the lid and the handle. I can't use tape or any other method, simply because it won't work. one thing you don't want to do is destroy the gilding. Roger is using an epoxy resin, a slow-setting glue. and then all we have to do is place that on there like that. just to help ease out any excess glue. Walk away and leave it. There's nothing else we need to do on that until the glue has set. Finally, Roger has got to match the paint. Here's hoping he has got the right colours for the job. that has been in Robert Parker's family for six generations. It has to be done very slowly. The first thing he did was to research the design for the missing cover. and make it into a conch-like shape. This leg needs to be turned down and split in half. One of these sections will then form the replacement cover. We've hollowed out the central area here. we have a chamber, which houses the mercury. simply to cover it up and make sure it's actually quite safe. Malcolm then has the exacting task of matching the colour of the new timber cover with the original wood. just to see how it matches. and it's going to look something like it should. The colour is coming up on here quite nicely at the moment. which he has to carefully cut out, then shape. It's a precise job. He's got to be bang-on for it to match. That needs to be glued onto there and then that's that done, basically. Finally, he has to rebuild the scale, which was made of paper and has now faded. he plans to cut out a new metal scale and have it engraved. You've got this scale here. stormy, much rain, rain, changeable, fair, set fair, very dry. Basically, that's the way it will go. Well, Malcolm seems to be storming along, but can he make that barometer work again? Coming up, will these two white-painted Pendelfin bookends weave their spell at auction? Has Roger's expertise saved the day? And will owner Marian be happy with the results? We've had queues of people here today at Stonyhurst. It may have rained outside, but it's been hotting up indoors. Our restorers have worked up quite a sweat, toiling over these lovely collectables. when the owners are reunited with their precious treasures. It's like new, isn't it? Rod had quite a task piecing together this Victorian chair. Time for the moment of truth. What will owner Fergus Brown think? This was the main area here, as you remember. Yeah! Yeah, you wouldn't even notice! and now it's been transformed. I had to replace the section of wood that was missing. And there was a hole as well, remember? -Incredible. You wouldn't even see it! Which is great! That's what I like to hear! So, I valued this chair on its own at £60. Rod has charged £150. between £600 and £800 at auction. when two Royal Worcester vases arrived, one of them in pieces. What will owner Marian think now? Let me be very careful here, very gentle. -So, what do you think? because we're very fond of these vases and pleased to have them looking so nice again. When they arrived, one vase was in seven pieces. Now it's whole again and can stand proudly beside its twin. that you couldn't really tell which one had been broken! -I can't seen the join, that's for sure! a display cabinet with a key in the lock. I'm so pleased! Giving all these fabulous treasures a new lease of life is so rewarding. Our restorers really are a talented lot and we've seen such a diverse selection of objects today. Rod gave this Victorian chair a good strong balloon-back. Now, the full set of eight can go to auction. Let's hope the bidders are eager to buy. if they can conjure up a few hundred pounds at auction. and owner, Marian, is delighted she can now display the pair back at home. Finally, Malcolm has been slaving away on this very rare 18th century sign post barometer. So what will owner Robert Parker think of it? Right, let's see if we can remove this. Oh, golly, that is spectacular compared to what it was before, because there was nothing there. -It was just a sort of a piece of paper there. -Or the remnants of it there. if you like, so that's exactly how it would have looked. And I think there was a chip up... Wasn't one of these missing, I think, up here? The left fleur-de-lis was missing up the top. You would hardly notice that was gone at all. Malcolm has transformed this weather-beaten heirloom. The fleur-de-lis was broken off, so Malcolm has crafted a new one. and now, using a piece of mahogany table, it's been remade. and I think it looks OK on there. the "much". We wouldn't have described it like that now. -In Lancashire, it will definitely be "much rain"! 230-odd years old. It's great to have it back, really! and we're hoping that some keen buyers will bid for these 1950s Pendelfin bookends. Owner Mike Smith couldn't be here, so he's sent his son, Ryan, to keep an eye on things. and we estimate that they could make between £300 and £400. so be sure to check with the auction house. Everything that has been restored should be noted in the catalogue. We come now to the Pendelfin pair of fairy bookends, £200 for them. A rare pair of bookends. 200 on the telephone. 360 again on the phone. At 360 on the telephone. Anybody else, quickly now? 380. -£380 it is. What do we think? -Really, really good, yeah, it's brilliant! That is a result, isn't it? That's magic! I'm delighted they've done so well! Now it's time to see how the Victorian chairs do at Salders Auction in Essex. They've been in Fergus's family for generations, so cost him nothing. Rod has charged £150 to restore one chair. could fetch between £600 and £800. Eight chairs, good set of eight, 1729, 500 I start. At 500. Frank is showing one there. £700 I'm bid. 750 anywhere? Commission bid, both out in the room. I will sell. At £800. Fergus couldn't be with us today, so I'm going to give him a call. The good news is they've made £800 today. Oh, fantastic! That's excellent! Oh, good, well done! that's virtually bang-on as you said! That's fantastic! Keep going, I love all these adjectives! and thanks to our restorers, we've managed to put some smiles back on our owners' faces. So join me again for another transforming slice of Restoration Roadshow. 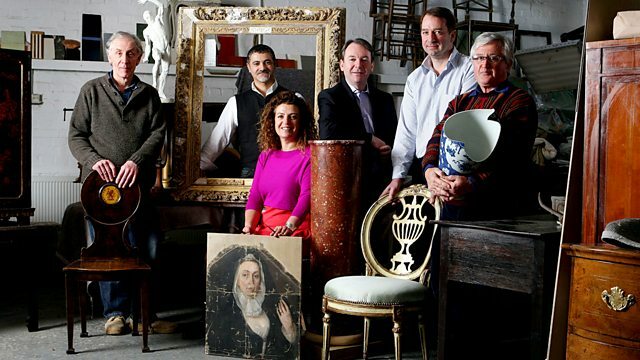 Series devoted to saving treasured heirlooms from the scrapheap, restoring them to their former glory and maybe even making some money at auction. In the beautiful surroundings of Stonyhurst College, Lancashire, the public bring in an ever-growing number of ‘patients’ and soon everyone is working flat out. Furniture restorer Malcolm Green comes under pressure as he attempts to restore a 17th century barometer. Rod Titian has his hands full fixing a badly damaged Victorian balloon back chair. And Roger Hawkins has double trouble. In addition to piecing together a shattered and less than regal looking Royal Worcester vase, he also has to assess the condition of a pair of enchanting Pendelfin bookends made at a local pottery. The restorers are soon weaving their magic, but will the owners be enchanted by the results? And if any restored items go to auction will they cast a spell over the potential bidders?